Xu et al. of the Jacobsen laboratory have extended the application of Brønsted acid cooperative catalysis (more specifically enantioselective organocatalysis) using chiral thiourea's to the Povarov reaction (DOI). Cooperative acid catalysis using achiral urea's resulting in racemic products was already introduced by Weil et a. in 2008 (DOI) and Jacobsen had already tackled another asymmetric reaction - the Pictet-Spengler reaction - in 2009 using a very similar protocol (DOI). Also applied in asymmetric reductive amination (Li et al. 2009 DOI) , asymmetric alkynylation of Imines (DOI) . In this Povarov reaction benzylidene aniline (the imine product of aniline and benzaldehyde) is reacted with 2,3-dihydrofuran to a tetrahydroquinoline with the Brønsted acid triflic acid. The product forms as an exo and endo mixture with the endo isomer (phenyl group and pentacycle on opposite faces of the piperidine ring) favored by 2 to 1. As the reaction is achiral both isomers are present as a 1:1 mixture of enantiomers bringing the total to 4 different isomers. The goal in asymmetric synthesis is the formation of just one isomer and in one particular strategy chirality present in the catalyst drives the formation of just one enantiomer through asymmetric induction. 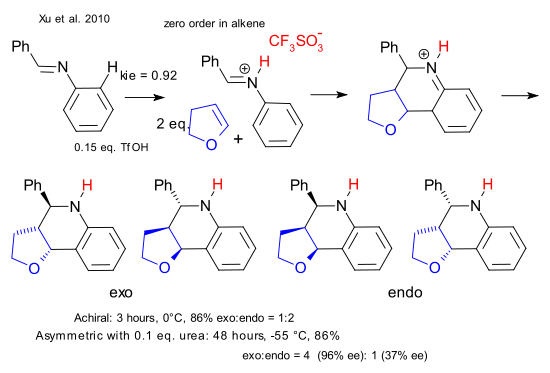 Simple acids such as the proton cannot be placed on a chiral scaffold and that is where the cooperative catalyst comes in. With the chiral urea present at 10% loading the reaction slows down to a trickle but the exo:endo ratio is now 4:1 with the exo isomer present in 95% enantiomeric excess (endo isomer 37%). 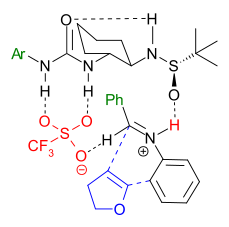 The transition state picture shows that the urea has a firm grip on the acid-iminium ion complex through hydrogen bonding at the urea site and the sulfoxide site leaving only one avenue for attack of the furan molecule. The alternative furan approach from the right (flip the reactants but not the urea 180 °) that creates the minor enantiomer is less attractive because pi-pi interactions (in green) between the urea aryl group and the imine phenyl group are lost.